MuscleXP Complete Protein & Vitamin Shake Mix is made from whey, milk proteins and soy proteins. This has set the new standard: 122kcal Energy, 15g Protein, 0.3g Fat, 0g Sugar. This is one of the highlights of the drink mix. It provides 25% of the Daily Value of Protein from its nutritious elements that are beneficial for energy and strength. This product contains zero sugar along with 0.3g fat. Produced in World Class Global Manufacturing Values NSF-GM and ISO 22000, along with the commodity being OHSAS 18001 & ISO 14001 approved. 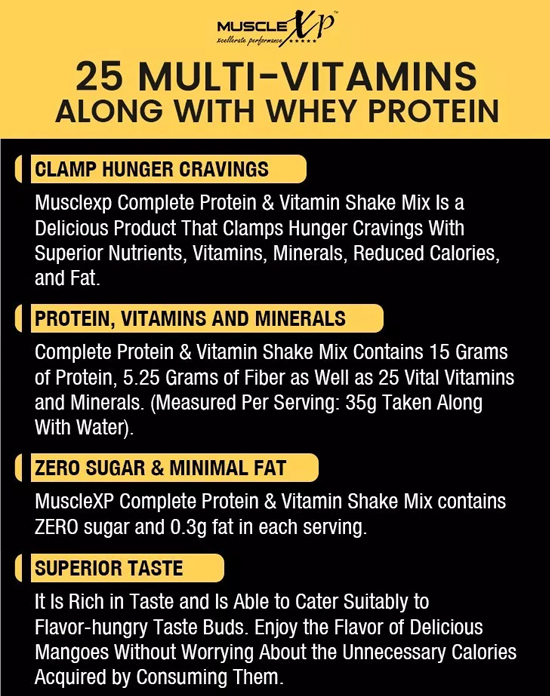 Why Do You Need MuscleXP Complete Protein & Vitamin Shake Mix? 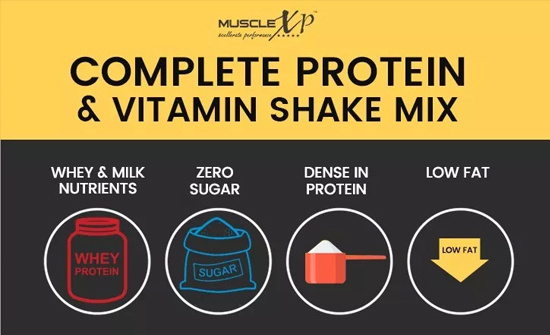 MuscleXP Complete Protein & Vitamin Shake Mix is a nutrition blend that caters to the vital nutritional requirements of men and women with the purpose of helping them look and feel at their best. It is now possible to get the nutrition that is needed to supplement a fit body externally and internally. MuscleXP Complete Protein & Vitamin Shake Mix contains 15 grams of protein, 5.25 grams of fiber as well as 25 vital vitamins and minerals. (Measured Per Serving: 35g taken along with water). MuscleXP Complete Protein & Vitamin Shake Mix contains ZERO sugar and 0.3g fat in each serving. It can be used as a breakfast meal substitute, a mid-day binge snack or before or after exercise energy drink. Quality, reliability, and scientific research have brought about the incorporation of vitamins and dietary supplements of unmatched excellence. With the usage of the greatest and most recent advancements in nutrition science, as well as the richest ingredients, these supplements have been created, which are of unmatched superiority and worth. It is rich in taste and is able to cater suitably to flavor-hungry taste buds. MuscleXP researchers have worked in collaboration with the industry’s best flavouring professionals to steadily ensure that every one of the high quality servings of Complete Protein & Vitamin Shake Mix, provides a delicious experience, while continuing to offer quality nutrition. It now becomes possible to enjoy the flavor of delicious mangoes without worrying about the unnecessary calories acquired by consuming them. Mango lovers are definitely in for a lip-smacking treat with this protein-packed drink. Whey Protein Concentrate, Skimmed Milk Powder, Maltodextrin, Inulin, Isolated Soya Protein, Minerals (Magnesium Oxide, Potassium Chloride, Sodium Chloride, Ferrous Sulphate, Zinc Sulphate, Manganese Sulpahte, Copper Sulphate, Potassium Iodide, Chromium Chloride, Sodium Molybdate, Sodium Selenite), Vitamins (Vitamin C, Vitamin E, Vitamin B3, Vitamin B5, Vitamin A, Vitamin D, Vitamin B6, Vitamin B2, Vitamin B1, Vitamin B9, Vitamin B7, Vitamin B12). This is delicious, healthy and filling. I like this especially because it does not contain added sugar and is rich in protein. An excellent sports drink for boosting energy and maintaining health. It mixes well without forming lumps. Great taste. This is a protein rich drink enriched with vitamins. I usually take it after workout. It helps re-energize and supports muscle recovery. Great taste. This is nutritious, protein rich shake. Helps restore energy. Great taste. This makes delicious and nutritious shakes. Mixes well. Does not leave lumps. It energizes me. Tastes good. Energizes me. A good source of nutrients. This protein-vitamin shake is an excellent product. It energizes me. I like this as pre workout shake. Liked this mango product shake. It is very energizing. I love this mango flavored shake. Rich in protein and vitamins it restores my energy level. This shake is delicious and nutritious. Excellent source of protein and other nutrients. It re-energizes me after workouts. This is delicious. It gives me energy and quickly satisfies hunger. Works well as post workout drink. A good energy boosting drink. I usually mix it with my morning smoothie. It provides the important nutrients. Good for health. This mango flavored protein shake is delicious and good for health. It is one of my preferred sources of protein and energy after workout. Tastes good and restores energy after exercise sessions. Contains the right amount of nutrients. An excellent nutrient rich product. It quickly energizes me. The mango flavor is delicious. This protein shake tastes really good. I feel full after taking it. An excellent source of protein. It gives me energy. A good energy booster. Great taste. Provides essential nutrients that keep me healthy. This protein shake gives me energy and satiates hunger. Great taste. A wonderful product for restoring energy after workouts. Great taste. With the right combination of nutrients it is good for health. This protein-vitamin shake tastes great and helps increase my energy level. It works well as post workout shake. Rich in protein and vitamins, this is a great energy booster. It dissolves quickly. Love the mango flavor. This is delicious and a good energy booster. It helps restore energy level after a high-intensity exercise session. A good energy boosting shake. Tastes good. A good source of protein and vitamins. This shake is easy to make. It dissolves quickly in both water and milk. Mango flavor tastes good. Add 2 scoops (35g approx) to 8-12 oz. (250 ml) of cold milk or water in a mixer or blender. MuscleXP Daily Super Greens with 16 nutrient-rich superfoods is a nutritional powder for supplemental use, provides essential nutrients to the body to support the healthy and active lifestyle. This product is a balanced blend of alkalizing, antioxidant and fiber-rich food elements. It is soy-free, sugar-free, non-GMO vegan product.